At the end of harvesting, Arnaud brings his olives to the mill empowered for transforming the olives from the organic agriculture (Bureau Veritas’s Certification). The olives are reduced into mash after being in the crusher. The obtained dough endure a long and slow mixing. 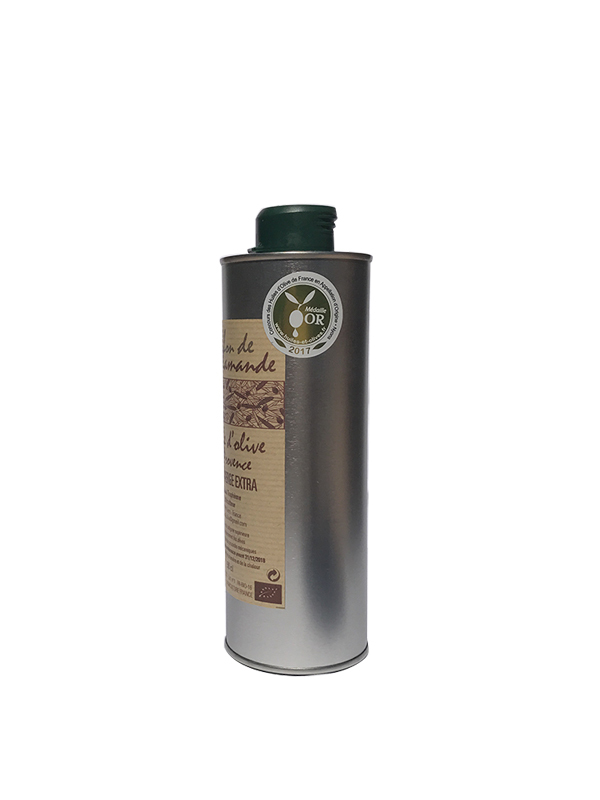 The olive pure juice obtained uniquely by a mechanical process, is now loaded of all the aromas. At the mill exit, the Extra virgin olive oil is very staunch. 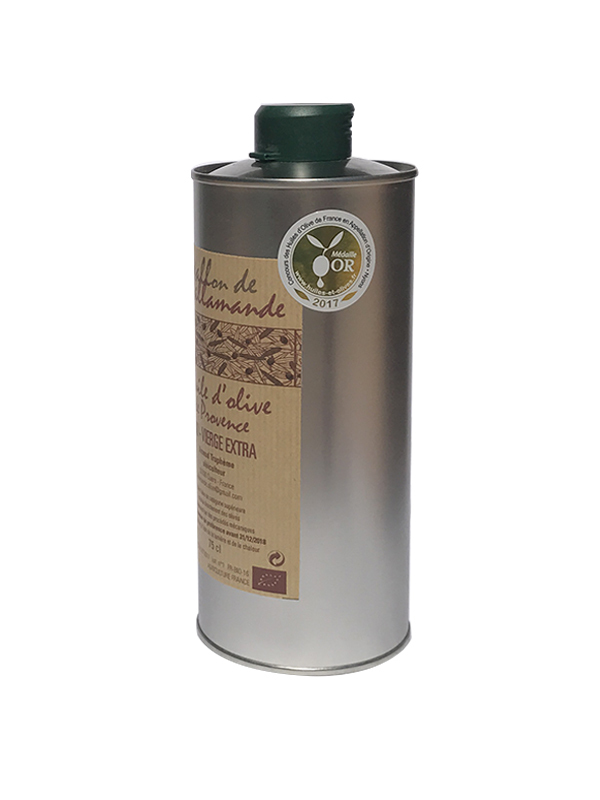 Through the weeks, the Olive oil of the Vallon de L’Allamande, wins some finessess and authenticity. Arnaud harvests the green olives at the beginning of November to get an AOC Olive oil of Provence and Organic, with green fruity and an amber color. 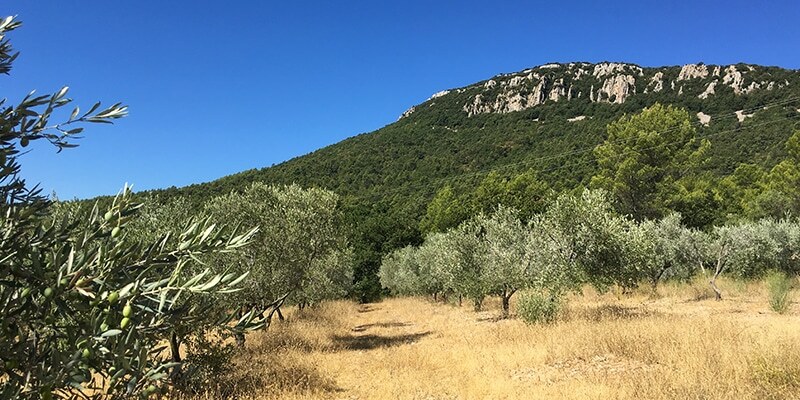 The Green fruity : the olives are harvested in the Vallon de l’Allamande at the beginning of maturity and triturated in the mill before 48 hours. The degree of acidity and the peroxyde index are minimal. The olive oil keep his containts of polyphenols and antioxidants. The aromas recalls principally the freshly cut herbs and the uncooked artichoke. Extra virgin Olive Oil certified Organic. 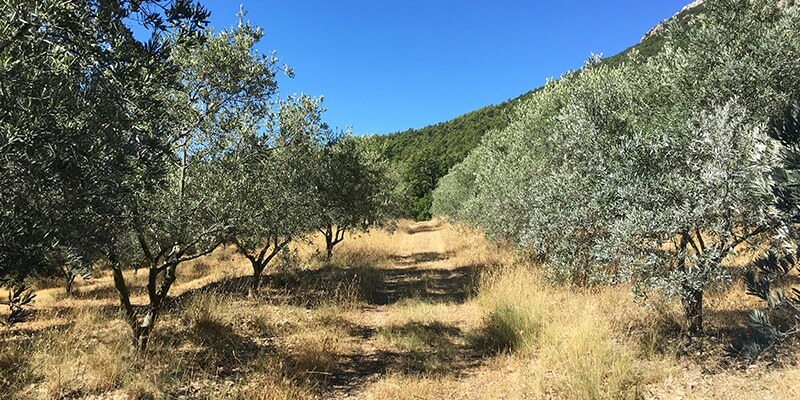 The Olive grove of Vallon de l’Allamande is planted of 2000 Olive trees. 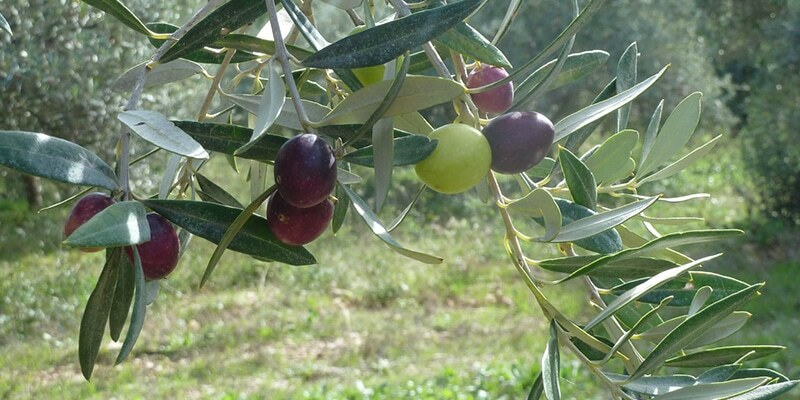 The olive production is becoming more rare through the years because of the drough periods in the Var. 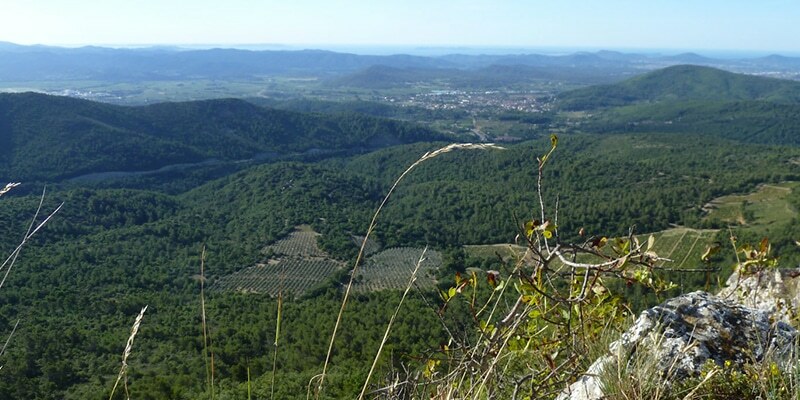 At the foot of rocky ledges of Cuers, in the Var hinterland, is located the Olive grove of Vallon de l’Allamande. 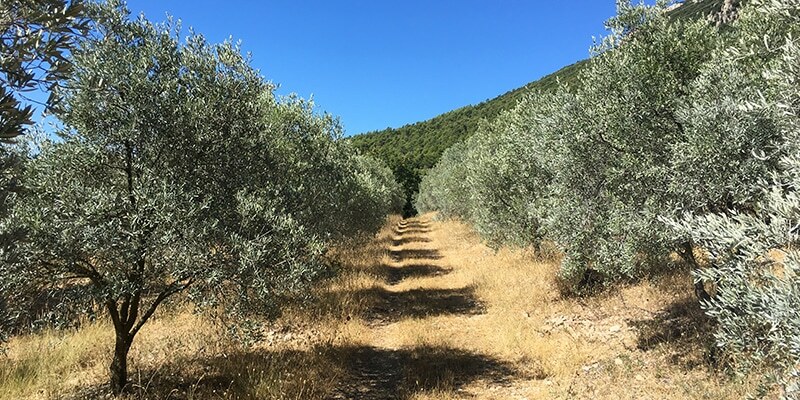 We have to follow a winding way to reach the fields of Arnaud’s Olive trees. In the middle of hills, this little terroir dedicated to the Olive trees culture since the 17 centory, dominates the mediterranean sea. With passion and patience, Arnaud replanted the Olive trees decimated by the frozen winter of 1956. 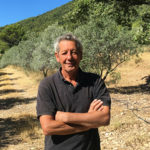 On this land privileged by an exceptional sunlighting and a stony ground, Arnaud is dedicating himself from 20 years to the organic culture of the olive tree. 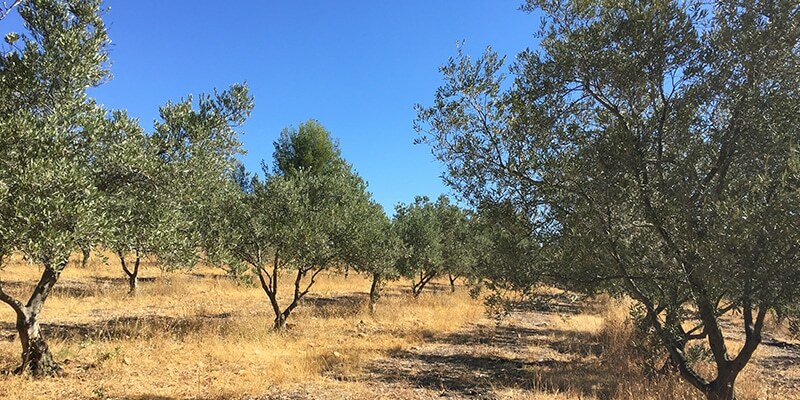 Arnaud’s Olive tree planting is respectful of the AOC Olive oil of Provence criteria and 100% organic extra virgin. 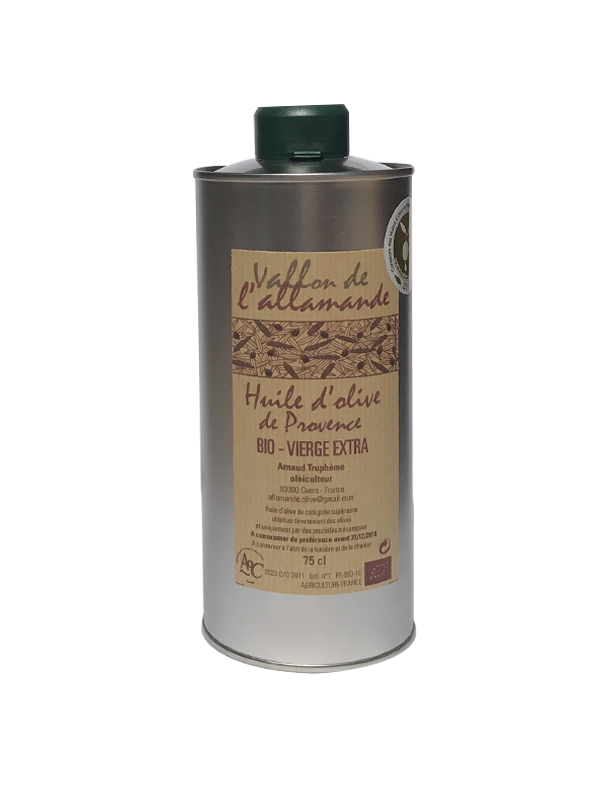 The Vallon de l’Allamande offers an Olive oil with an authentic green fruity, dominated by the herbaceous sensations from 5 varieties of olives. Aglandau : very pronounced with a vegetal fruity. The Olive oil is very staunch with a small bitterness. It gives a strong character to the Olive Oil. 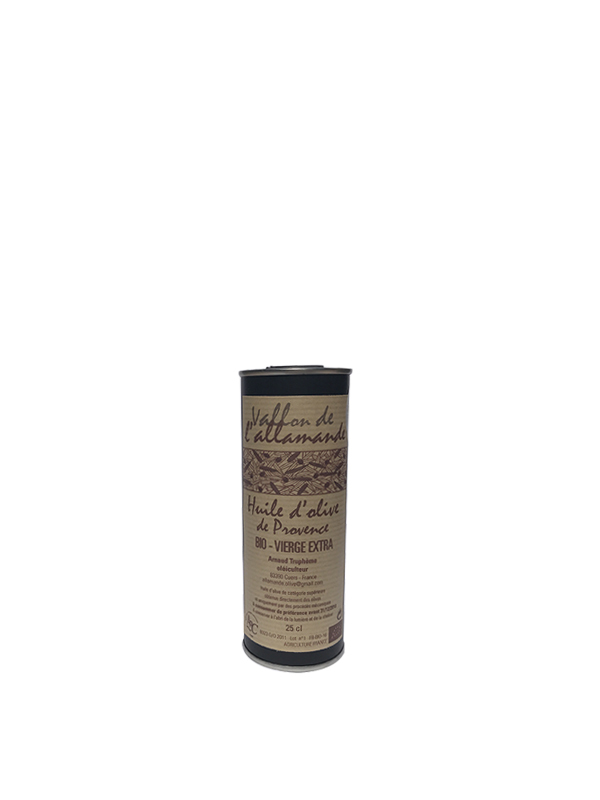 Bouteillan : The Green fruity with a strong artichoke savor. 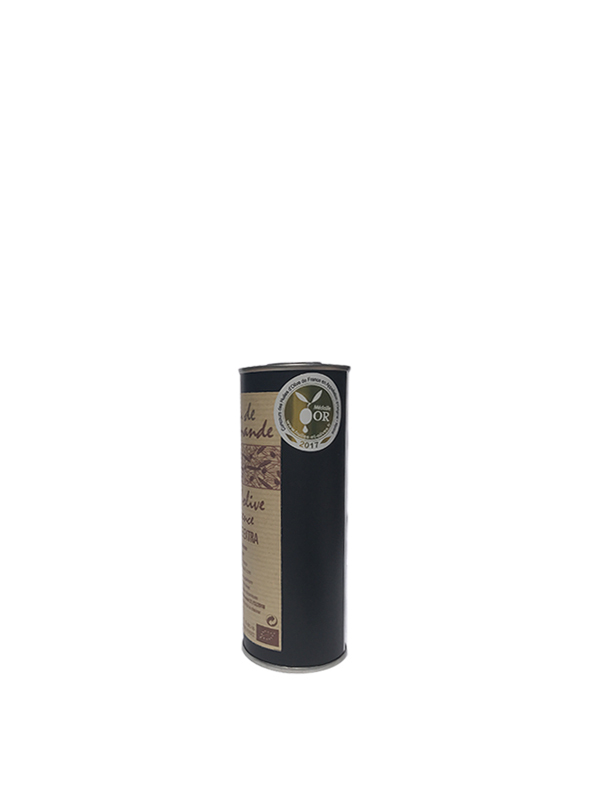 Cayon : A sweet Olive Oil with an almond savor, fruity and equilibrate. Without bitterness and asperity, this is a light and delicate olive oil. Cayet roux or Plant de Figanières : A very old variety, typical of the Var, renowned for the fineness of its olive oil. An intense aroma of green apple. 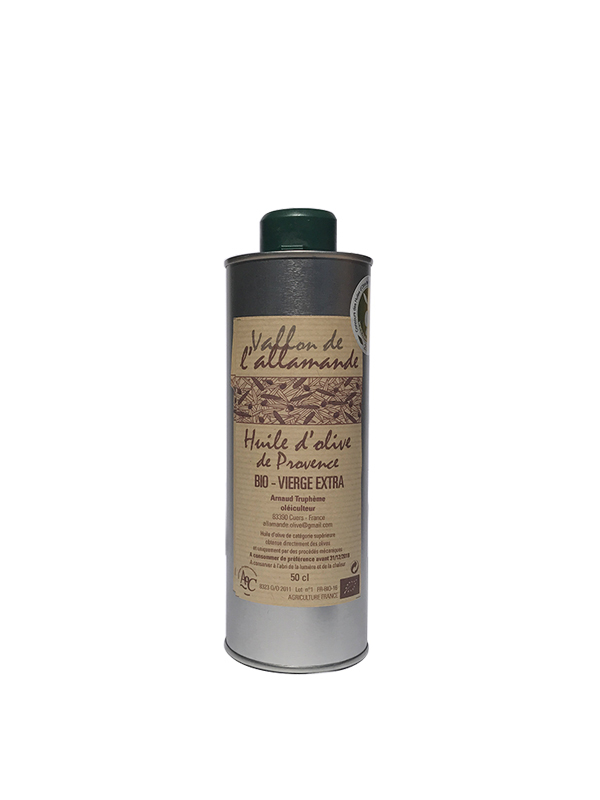 Salonenque : A unique fineness which allows to this Olive oil to be used in pastry. A sweet Olive oil, fruity with a buttery final note and aromas of almond, fresh apple and artichoke. Cru Agandau : Perfect on salads and fish. Cru Bouteillan : Perfect on tomato salads, steamed vegetables and fish. Cru Pitcholine : Taste revaler on cooked vegetables, fish, uncooked or cooked meats. Amators will appreciate a stream of Olive Oil on a good bread slice.